Home » Other topical issues » Organics, carts, and landfills » Regional Compost site reboot » Why not compost at Campbell Mountain? Space: there is not enough land available at the Campbell Mountain landfill to do a proper regional composting site (food waste and sewage sludge). Location: The Campbell Mountain landfill is located in a prime agricultural and residential area. That is, it already impacts far more residential properties than any other potential composting site. But on top of that, this hillside is one of the few locations where the City of Penticton can grow. Penticton's Northeast Sector Plan envisions putting an additional 3,400 units in the area surrounding the landfill (see the future land use map with the landfill smack in the middle). 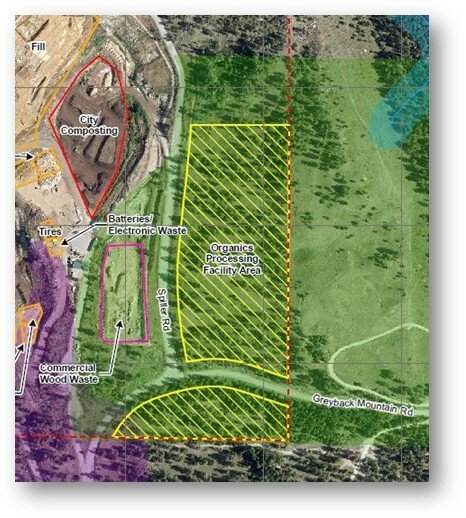 So even if the RDOS could aquire sufficient land around Campbell Mountain to construct a true regional composting site, doing so would undermine one of Penticton's major stratgic initiatives. This is shown on the map as the yellow area above Spiller Road. But this means one or more other locations need to be found to compost the new stream of chicken bones and moldy cottage cheese that we hope to divert from our waste stream. The cost of building and operating two state of the art, odor-controlled, leachate collecting compost facilities dwarfs the savings that can be realized by trucking less. Plus, a Penticton-only solution does nothing to solve Summerland's sewage sludge problem.